The dog, we know from Amazon, is called Flash. And exactly how Flash got injured is not known. But what we do see is poor Flash is hobbling along behind his owner Jessie. All around Flash, other dogs are doing dog fun things. Canines with four working legs are running circles around Flash while Jessie looks back in distress unsure of how to help his Maltese doggie. Then a flash of an idea and because this is a commercial for Amazon. Jessie decides to go on his phone and solve the problem by running the Amazon Prime app. He clicks a few buttons and the final scene shows the results of what Jessie was able to do by belonging to Amazon Prime. He was able to order a baby carrier for his doggie and Flash got a new mode of transport around. Watch and it’s okay to cry a bit. 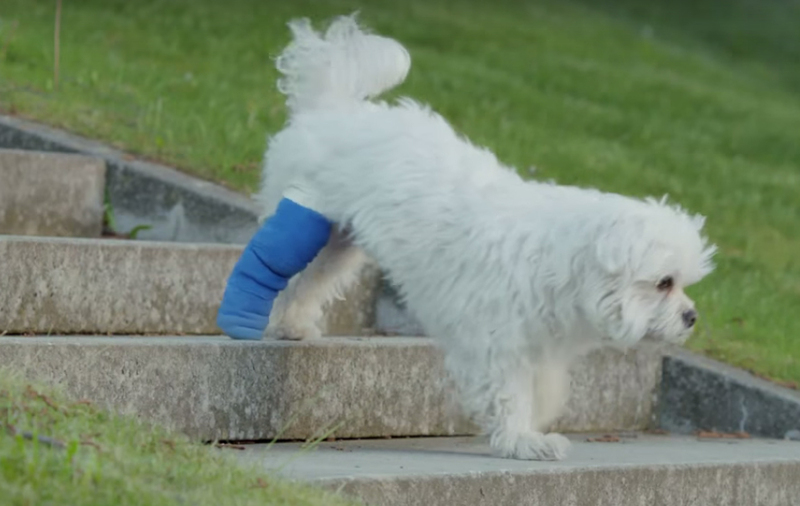 13 Comments on "Commercial with injured dog in blue cast will make you cry, darn you, Amazon!" I love that commercial. I usually hate commercials but this one is a prize. Both Flash and Jessie are so cute. Of course I am old enough to remember Lee Marvin in “Paint your Wagon” he had no idea then how popular he would be with that version of him doing the song. He would be pleased now how it is being used. Anyway Jessie looks so familiar to me – who is the actor who plays him? I want to adopt both Jessie and Flash. Ha. LOVE THE COMMERCIAL. PLEASE USE THAT YOUNG MAN AGAIN. HOW ABOUT IF HE “HELPS A CLASSMATE” HE AND THE MUSIC ARE AWESOME. 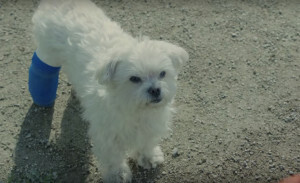 Notice how the puppy and Jessie look alike….both are so cute. I have this saved in every corner I can get it into because it makes me smile when a smile is needed. Flash and Jessie are AWESOME! This is not a Commercial… This is a masterpiece. Should be shown in Cinemas! It is an evergreen that should be used as a required teaching material, as how to make movies. Both Actors are brilliant, Music is fitting, the execution is astonishing. Wonder who made created this work of arts. Who are the Actors and Creators? I am almost 70 years old and I have never loved a commercial as much as I do this one. Everything about it is wonderful. A marriage of a classic song by the late Lee Marvin, an adorable, precious little puppy, a great actor and a fabulous director. I love happy endings. Long live Flash. A marriage of a classic song by the late Lee Marvin, an adorable, precious little puppy, a great actor and a fabulous director. I love happy endings. Long live Flash. Lee Marvin would have been proud.